Canterbury Bells White Campanula Medium is an old-time popular, herbaceous biennial native to southern Europe. 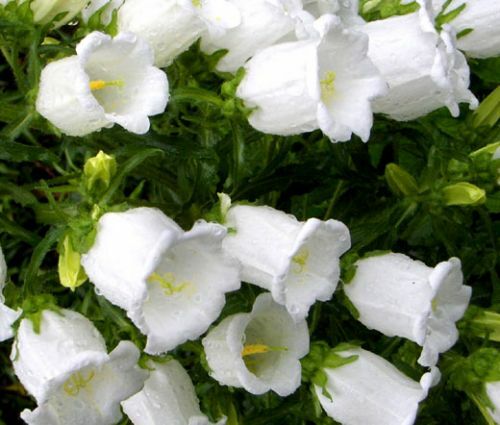 Campanula Medium can be easily established from Canterbury Bells seeds, and this variety of Campanula features tall flower stalks that are held atop a low mound of foliage with bright-green, narrow leaves and produces rare, extremely showy, large, white bellflowers. Canterbury Bells bloom for several weeks from spring and into the summer, and dainty spikes of large white bellflowers are very noticeable in a garden. Canterbury Bells White is a popular choice for container planting and one of the best cut flowers to grow in a cutting garden. Canterbury Bells can be used for any general garden application, and they look exceptionally well in mass planting. Campanula Medium seeds are easy to grow, and this bellflower grows best in full sun and moist well-drained soil. Campanula tends to self-seed itself, and if conditions are right, it will last for years in the garden.